Transitioning to dementia care can be challenging because it requires seniors and their loved ones to admit that they can no longer manage dementia on their own. Despite these initial challenges, most seniors are happier and healthier in quality dementia care communities. Here’s how to broach the issue, initiate the conversation, and manage the move. Before you broach the topic of dementia care with your loved one, educate yourself. There are many types of dementia, so talk to your loved one’s doctor to learn more about their specific diagnosis. The way your loved one’s disease progresses may depend on their diagnosis, overall health, and many other factors. What resources does my loved one have available? Am I able to financially contribute? What is my loved one’s diagnosis and prognosis? How severe is their dementia, and how quickly will it progress? Does my loved one understand what is happening? Are they willing to consider dementia care, or are they going to resist any attempts at help? How does the rest of the family feel? Are loved ones in denial? Are there people who will oppose dementia care? Does my loved one have the ability to make decisions about their own life and health? If you suspect your loved one may not be fully competent, believe they will not consent to care, or worry about interference by other family members, consider meeting with a lawyer first. In some cases, you might need to pursue guardianship. Find an elder care lawyer here. What does my loved one need to be safe? What does my loved one need to be happy? What are the biggest care barriers I experience? What are my biggest worries about my loved one’s safety and health? Dementia may affect a person’s ability to care for themselves or make good decisions, but it does not remove their fundamental humanity. Your loved one still wants to control their own fate, to live a life of purpose, and to not feel forced into anything. So begin the conversation as a collaborative effort. Your loved one should not feel that you are imposing your will or attempting to “put them away in a home.” If they do, they may resist any help. This can jeopardize their safety and your relationship. Begin by asking your loved one what they want and how they feel about their diagnosis. Present dementia care as one option. Work to dispel myths about memory care; some seniors believe it means being locked up or prevented from enjoying hobbies and living an engaged life. Listen to your loved one. People who feel heard are more willing to compromise. Don’t dismiss or ignore your loved one’s fears, even if they seem silly to you. Involve other family members, if possible. Emphasize your love and concern. Seniors fear being a burden or an inconvenience. Explaining that you want to help, not control, reminds your loved one that you care and may help relieve any guilt or shame they feel about their diagnosis. Don’t make this about your feelings. Center your loved one’s feelings and needs. Know that dementia is going to interfere with your loved one’s ability to have a rational conversation. If they react with anger or aggression, it’s the disease talking. Keep your own emotions in check. Consider having multiple conversations, especially if your loved one is resistant at first. It takes time and planning to come to an agreement on the right senior living option. So don’t rush your loved one. Give them time, space, and plenty of love. If you still can’t get them to agree, involving their doctor may help. If your loved one has severe dementia and is resistant to all help, you may need to seek guardianship so you can make decisions on their behalf. Tour dementia care communities together, and encourage your loved one to share their feelings and opinions. This is their life, and it will be their home. So don’t impose a decision on them. Guide them as they evaluate options, but encourage them to make the decision that feels right to them. Moving can be stressful, as anyone who’s ever waited for movers to show up can attest. Transitioning to dementia care is no different. It requires time, planning, patience, and a chance to adjust. Help your loved one declutter their house. This can feel daunting, so set aside plenty of time. 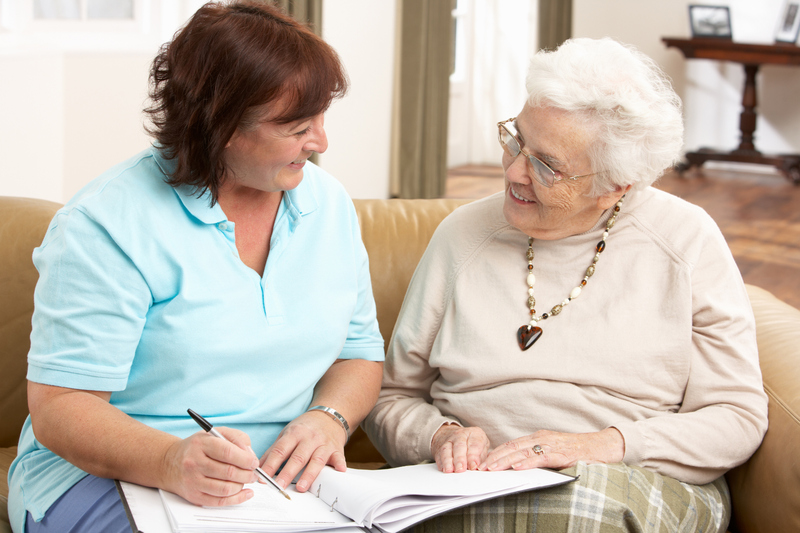 Work with your loved one to plan their first few weeks in dementia care. Knowing they have something to look forward to can make the transition easier. Talk to the senior living community about what you can do to ease the transition. Many communities have transition counselors and welcoming committees. Learn all you can about the community. It’s easier to move into a place that feels familiar. Don’t tell your loved one they need more help, even though severe dementia inhibits a person’s ability to identify this issue. Instead, frame the switch to dementia care as a chance to live a better life, get better food, and have more free time. Don’t force your loved one to make all the decisions. People with dementia cannot make good decisions once the disease progresses. So if your loved one has mild to severe dementia, plan the move on their behalf, and then find ways to involve them in the smaller decisions. Schedule the move-in time for your loved one’s best time of day. Many seniors with dementia experience “sundowning,” the tendency to decline as the day goes on. A morning move is often best. That means you’ll need to have everything packed and ready the night before and plan to rise early in the morning. Attend events at the community before the move, so that the community feels comfortable and familiar. Ask the community you have chosen about support groups. Being a caregiver is tough, even when you have the support of a loving community. You may feel like you're watching your loved one slip away. The right support group can help you feel less isolated and better equipped to cope with dementia caregiving. Visit often, especially in the early days. This can counter your loved one’s fears that they have been abandoned and discarded. Get to know the staff. Be friendly and warm with them, and ensure they have key information about your loved one. Listen to your loved one’s complaints. It’s normal to feel frustrated and anxious following a move. Telling your loved one they are overreacting or being excessively critical is demeaning. Be prepared for a rocky transition, but know that it gets better with time. Ensure your loved one has access to their favorite things. Music can be especially effective at calming the anxiety of dementia, particularly during challenging transitions. Arbor Terrace of Waugh Chapel is Baltimore’s premier dementia care community. We offer a safe and supportive environment that nurtures your loved one’s interests and passions while supporting your family as they navigate the rocky terrain of dementia. Our vibrant communities offer socials, outings, classes, exercise, exceptional meals, and so much more. Dementia is painful, but it does not have to steal your loved one’s happiness. With the right support, your loved one can continue leading a good life. If you’re ready to evaluate your options, give us a call. We’d love to see you at one of our community events. We can take you on a tour, answer your questions, and help you manage your loved one’s transition to dementia care. We’ve been on the cutting edge of dementia care for 30 years. We can’t wait to show you how good life with dementia can be. Interested in learning about our dementia care community near Baltimore, MD? Fill out the form below.